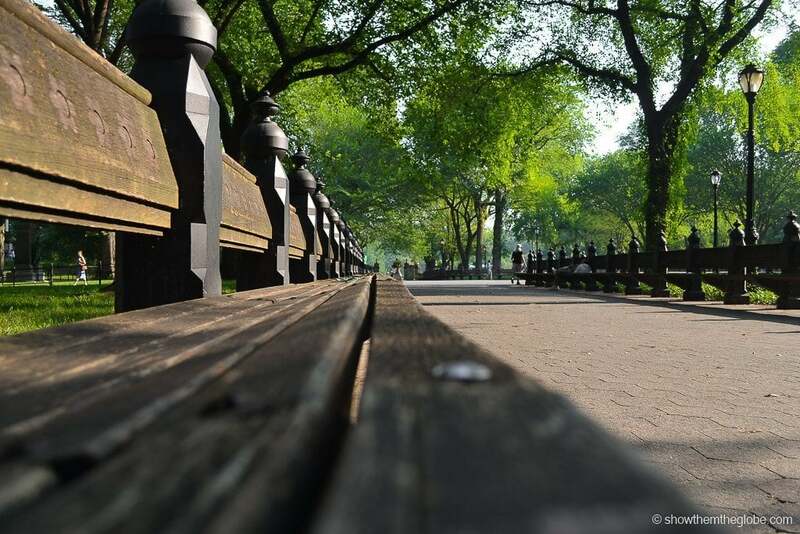 Manhattan’s largest green space is the perfect spot for an adventure filled New York day and there are lots of fun things to do in Central Park with kids. 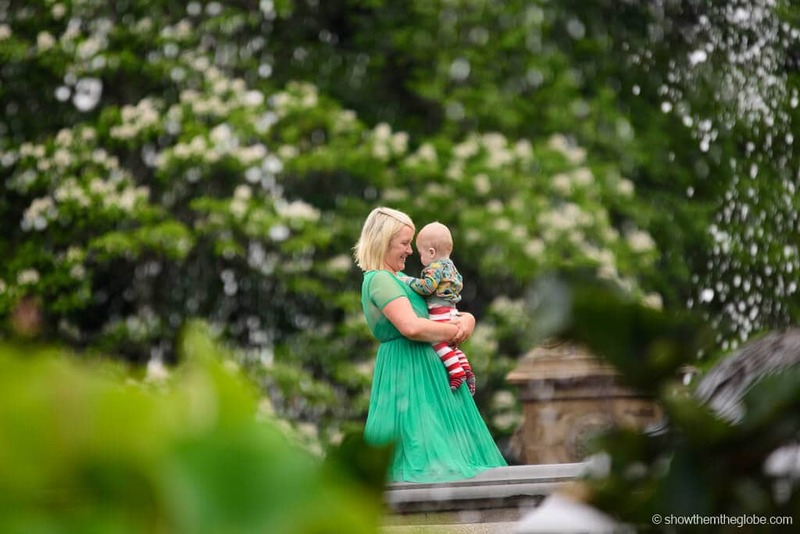 From rowboats and model sailboats to storytelling sessions and enchanting statutes as well as whimsical fountains and castles there’s something magical about exploring Central Park with kids and discovering it through their eyes. We’ve put together this guide to the best things to do in Central Park with kids to help you plan your adventures in Central Park for kids! Once our local neighbourhood park, we’ve spent countless hours exploring Central Park and have loved sharing all our favourite spots with J. Here are our 20 best things to do in Central Park with kids! Riding the beautiful vintage horses at Jane’s Carousel is an absolute must do when exploring Central Park with kids. The historic carousel dates back to 1871 although it has been replaced multiple times since. The current carousel houses 57 vintage horses and costs around $3 a ride. The mix of retro horses, uplifting music and Central Park setting are sure to bring both nostalgia and a smile to your face! 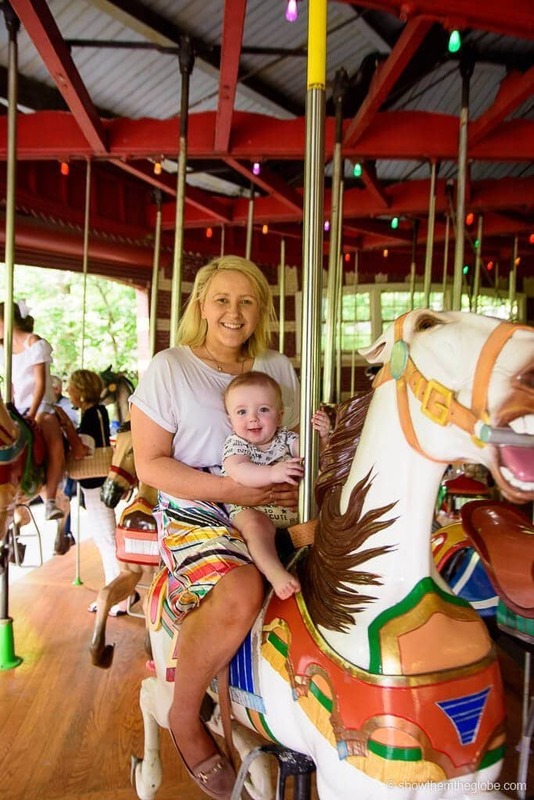 Best things to do in Central Park with kids tip: Literary fans will remember that the carousel made an appearance in JD Salinger’s classic novel, Catcher in the Rye, when Holden watches Phoebe ride the carousel. Residence Inn New York Manhattan Central Park: our choice as the best place to stay with a family in New York. We’ve stayed here numerous times and with extended stay suites with fully equipped kitchenettes, washer/dryer and huge living space it’s perfect for families – check prices now! Q&A Residential Hotel: spacious full-sized apartments in an Art deco building in the Financial District – check prices now! Radio City Apartments: comfortable and affordable rooms with kitchenettes close to Radio City and Times Square – check prices now! EVEN Hotel New York Times Square South: spacious rooms in the heart of the Garment District close to lots of Midtown sightseeing and shopping – check prices now! Hotel Giraffe by Library Hotel Collection: close to Union Square and Chelsea with a rooftop garden for relaxing afternoons. Perfect for exploring downtown – check prices now! 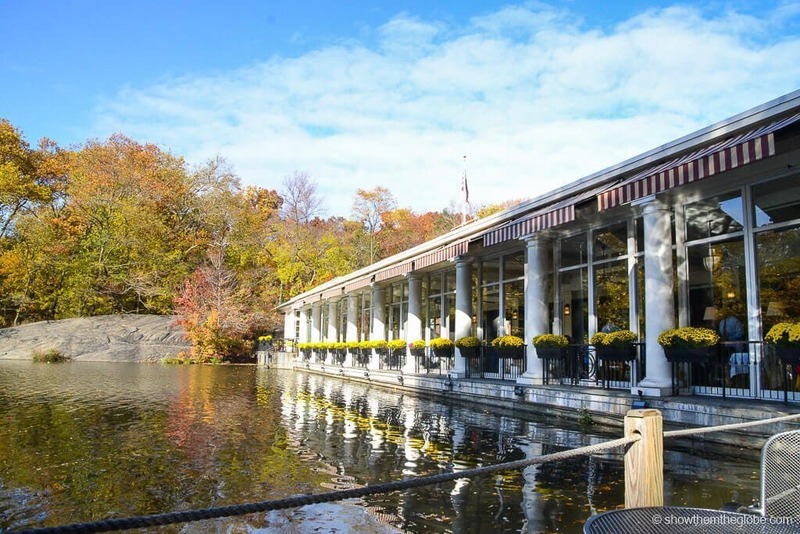 Take to the lake at the Loeb Boathouse, a Central Park icon! The boathouse now serves as a bar and restaurant but it’s still possible to rent a rowboat from their 100 strong fleet. Rowing across the serene 22-acre lake, it’s easy to forget you are in the centre of the Manhattan but the amazing views of the New York skyline are a stunning reminder! If you prefer to be rowed rather than row yourself, hire one of the Venetian Gondola’s for a guided tour and maybe even a song! Best things to do in Central Park with kids tip: it costs $15 an hour (plus a $20 deposit) to hire the rowboats and each boat holds 4 passengers. Gondolas are $45 per half hour and can take up to 6 passengers. Make sure to bring cash. The beloved fairytale ‘The Ugly Duckling’ has been a childhood favourite for over 100 years and Central Park pays homage to both its author, Hans Christian Anderson, and the little duckling. In a quiet spot overlooking the Conservatory Lake, Hans reads his creation The Ugly Duckling while the little duckling sits at his feet. Kids are welcome to climb the statue much to their delight! 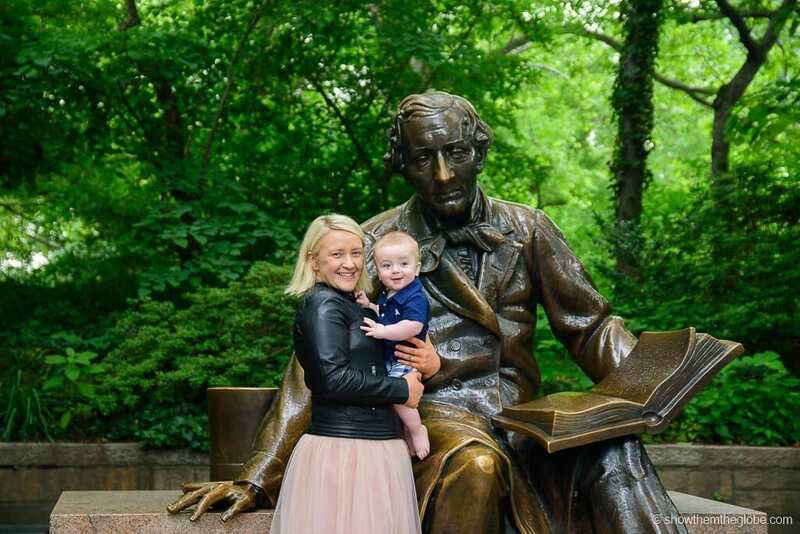 On Saturday mornings from June to September, children are welcome to gather around the statue for a storytelling session between 11 am and 12 pm. If you visit during the summer, make sure to drop by and enjoy a reading, sometimes by a celebrity, from some of his most famous books! 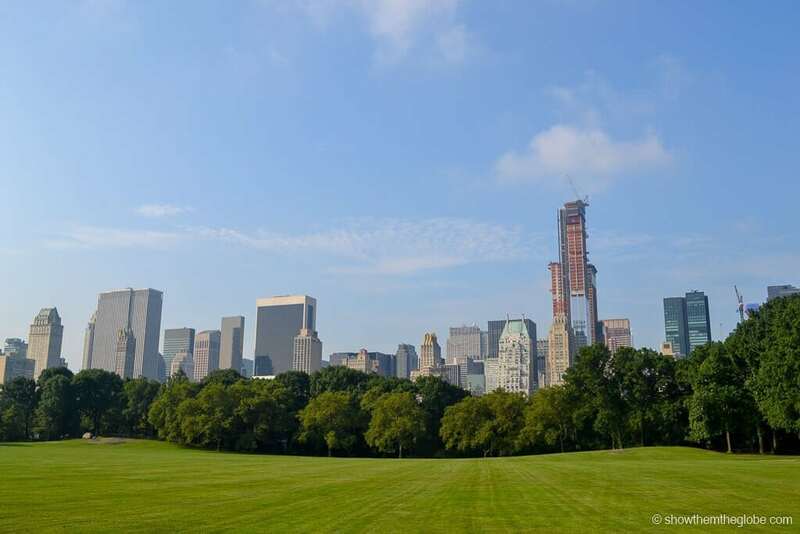 Sheep Meadow is the perfect place to spend a sunny afternoon in Central Park. It’s hard to imagine now but the area became known as Sheep Meadow when it was used for grazing sheep up until the 1930s! Sheep Meadow is a magnet for both locals and tourists and is an amazing NYC spot for people watching. Bring a picnic, a good book and a frisbee and enjoy chilling out under the backdrop of the Manhattan skyline. 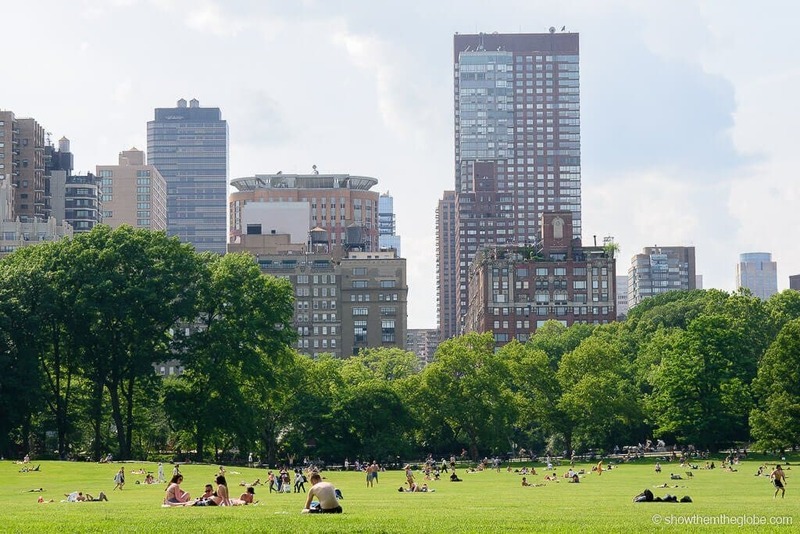 Best things to do in Central Park with kids tip: Organised sports and events are prohibited in Sheep Meadow as the area is designed for hanging out and relaxing. It’s likely that yoga or frisbee is the most energetic sport you’ll see making it an excellent kid friendly option. Located above the brick arches close to the Children’s Zoo, the Delacorte Clock is Central Park’s performing musical clock and children flock to the clock to catch a performance! The clock plays a selection of nursery rhymes and songs including classics such as Singing in the Rain and Hickory, Dickory, Dock. During December the nursery rhymes are replaced with seasonal tunes! The clock face is surrounded by a wildlife themed animal carousel: when the music plays, the resident penguin, elephant, goat, hippo and bear swirl around the clock! 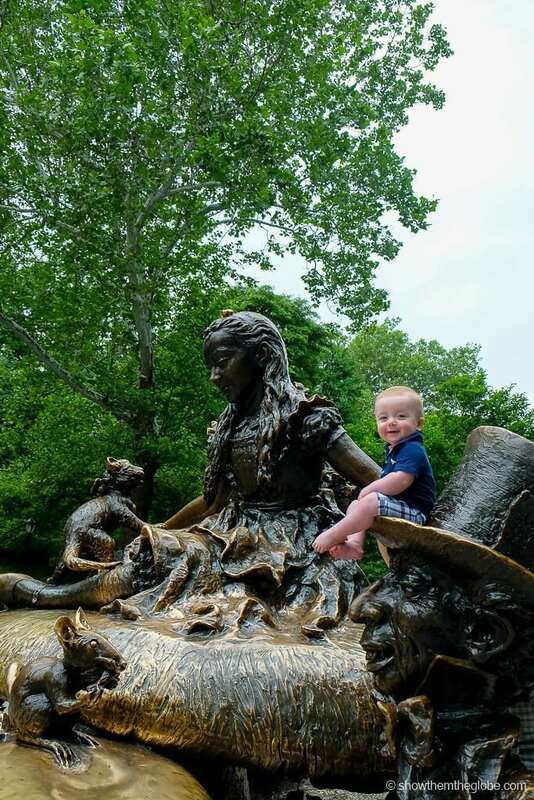 Best things to do in Central Park with kids tip: the clock performances take place between 8am and 6am and, every hour, on the hour, plays one of 32 nursery rhymes. There’s a shorter performance on the half hour. With almost 850 acres of park, bikes are the perfect way to explore Central Park and see as much as possible in a short time. Park Drive offers cycle loops of various distances (6.1miles, 5miles and 1.7mile routes) which will take cyclists past some of the park’s most iconic sites. It’s best to reserve a bike from a shop near one of the entrances to the park so you don’t have to walk too far with a bike and kids in tow! Many of the rental shops offer kids seats and trailers which attach to the bike, both great options when your little one is too young to cycle themselves. 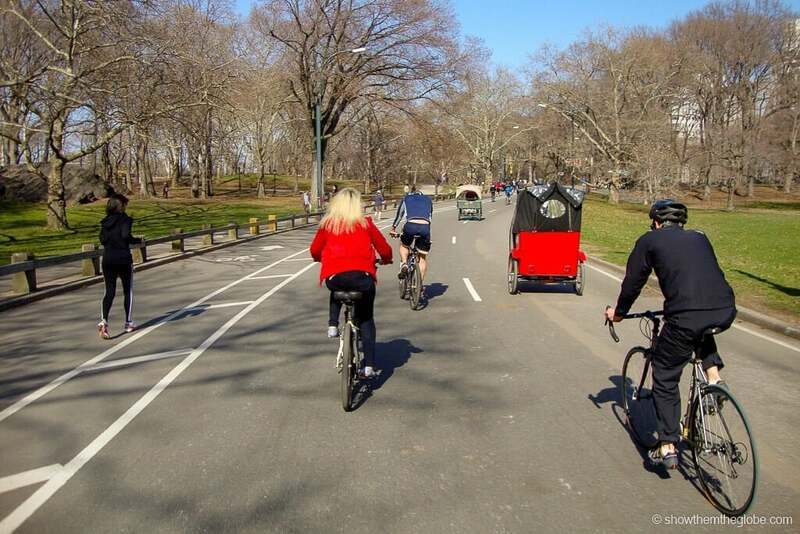 Best things to do in Central Park with kids tip: Make sure to follow the rules while cycling through Central Park. The cycle route follows a one-way system – cycling is not permitted on pathways and pedestrians always have right of way. Central Park is famous for its playgrounds so make sure to stop by one of the 21 dotted at various locations throughout the park. The playgrounds are all unique in theme and design and feature water features, slides, swings, tunnels, sandboxes and bridges for kids to clamber over. Our favourite park is the Billy Johnson playground at 67th and 5th The design is based on the landscape of Central Park and there are two awesome granite stone slides built into the hillside. For younger kids, the Tarr-Coyne Tots Playground on the West Side at 68th Street is a great option. Best things to do in Central Park: The Central Park playgrounds are only accessible when visiting with a child and are open from dawn to dusk. 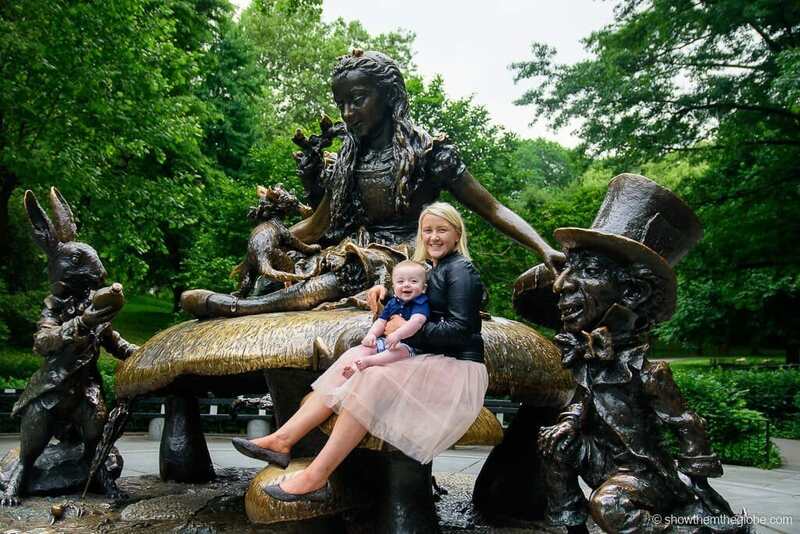 The Alice in Wonderland statue, where The Mad Hatter, the March Hare, the Cheshire Cat, the Dormouse and Alice gather for a tea party, is a firm favourite with kids in Central Park. The childhood classic is a magnet for kids who love to clamber over the tea party guests! Kids will love to the story behind the statue of Balto, a heroic dog who made a 537 mile journey through Alaska from Anchorage to Nome with diphtheria vaccines. In 1925, when Nome suffered a diphtheria outbreak, 20 guides and 100 sled dogs transported the vaccines in challenging weather conditions and Arctic blizzards. Balto was one of the heroes of the expedition and his statue was erected in Central Park in acknowledgement of the indomitable spirit of the sled dogs who are credited with helping to save the young population of Nome. Close to the Alice and Wonderland and the Ugly Duckling statues, adults and children alike revel in sailing model boats on the Conservatory Water. The boating season runs from April to October and boats are available to rent throughout the week from the Kerbs Memorial Boathouse. Saturday is race day and it’s fun to watch the radio controlled boats racing across the water. 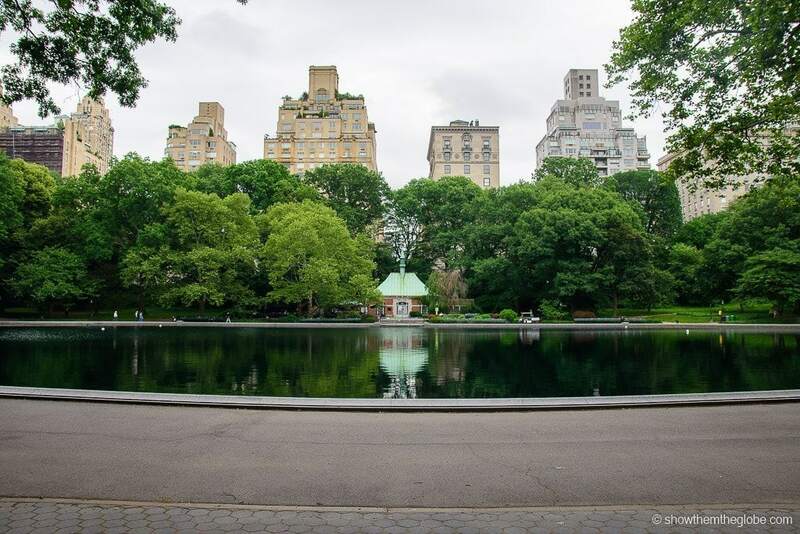 Best things to do in Central Park with kids tip: literary fans will recognise Conservatory Water as the spot of the boat scene in the EB White children’s classic, Stuart Little. It was here that Stuart helps his friend George win a model boat competition and it appears in the movie version as well! A Central Park staple since 1877, the Swedish Cottage became home to a travelling marionette company in the 1940s and a theatre was constructed inside the cottage. The quaint Swedish Cottage hosts puppetry performances in Central Park. It is aimed at younger kids and is a great place to watch a fairy tale come to life through the magic of the puppets. Past performances include Puss in Boots and Peter Pan. 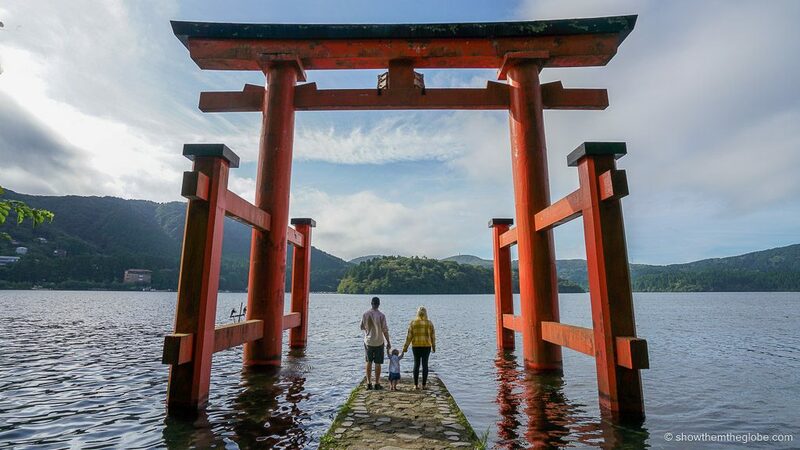 Best things to do in Central Park with kids tip: Tickets need to be reserved in advance so make sure to purchase online if you want to catch a show in the theatre. Belvedere Castle is a whimsical castle located on Vista Rock in Central Park. 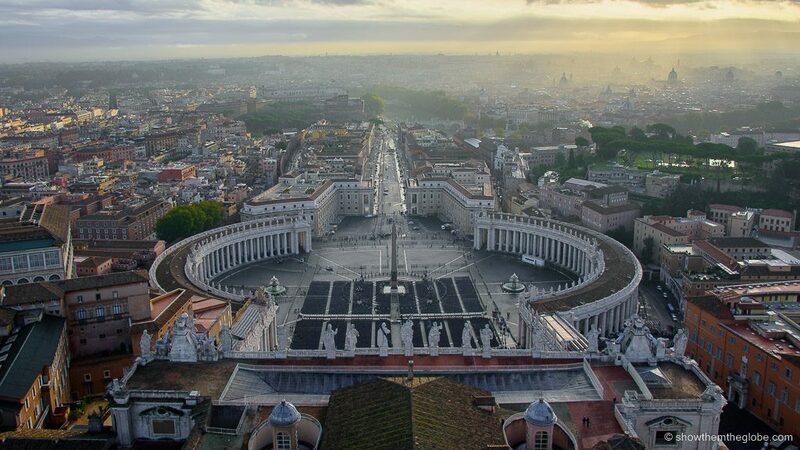 It was named for the Italian ‘Beautiful View’, a fitting name given its stunning views of the Great Lawn and the lush Central Park woodlands. The castle was originally built as a decorative Victorian Folly and lookout tower before serving as a weather station and has now been converted into a visitor’s centre. Belvedere Castle now houses a natural history collection. It hosts various family-friendly events and the highlight is the Halloween Haunted House! 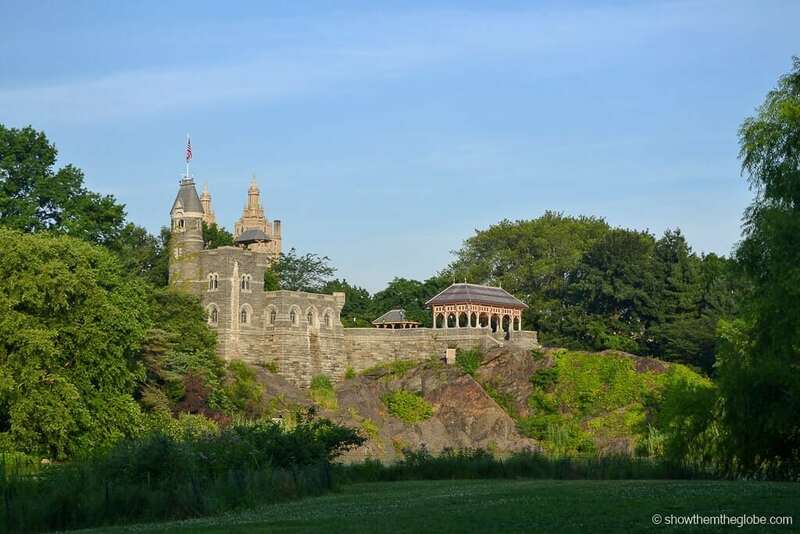 Best things to do in Central Park with kids tip: Belvedere Castle has been closed for restoration since February 2018 and is expected to open during 2019. The Butterfly Gardens were created to help support Central Park’s monarch butterfly population together with a variety of moths, insects, and birds. The summer months are a good time to see the butterflies before they begin their migration south. The leafy Central Park Mall runs through the middle of the Park from 66th street to 72nd street and is a hive of activity during the day with street performers, skateboarders, walkers and people watchers. The leafy pathway contains statues of four famous writers: William Shakespeare, Robert Burns, Sir Walter Scott and Fitz-Greene Halleck. A statue of Christopher Columbus in the same stretch is usually referred to as the odd one out given his literary company! If you venture uptown as far as 110th street then check out the Lasker Pool and Ice Rink – a pool during the summer months and an ice rink during the winter, it depends when you visit if you swim or ice skate! Due to the uptown location, Due to its location, Lasker tends to attract lots of locals rather than tourists but it can be a good option if you are in search of a pool on a hot day. The pool is free of charge and often gets very busy during hot weather: as a result visitors are not allowed to bring anything (even a newspaper or book) poolside and must have a padlock to secure shoes and other items in the lockers. Best things to do in Central Park with kids: Lasker Pool and Ice Rink are set to close in 2020 for major refurbishments so make sure it is still open if you are planning a visit. 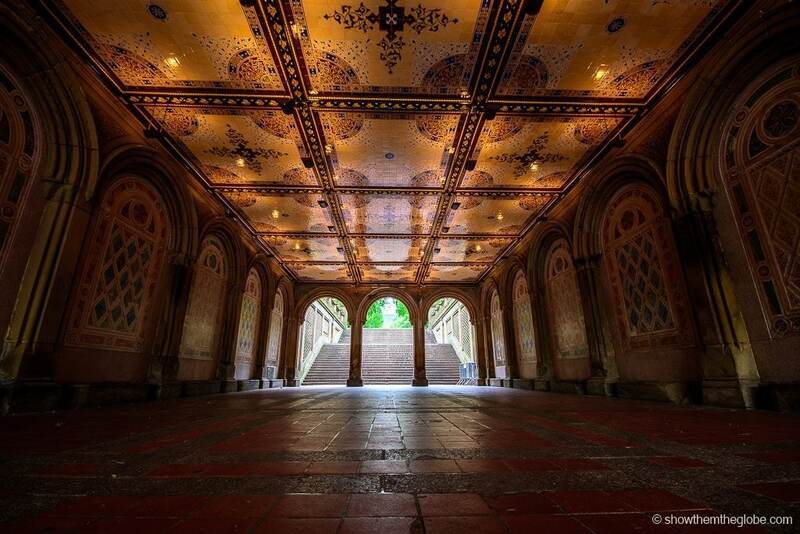 At the heart of Central Park sits the stunning Bethesda Terrace and Fountain. The open-air terrace is one of the most beautiful spots in the park and is renowned for its colourful ceiling comprised of 16,000 patterned tiles. 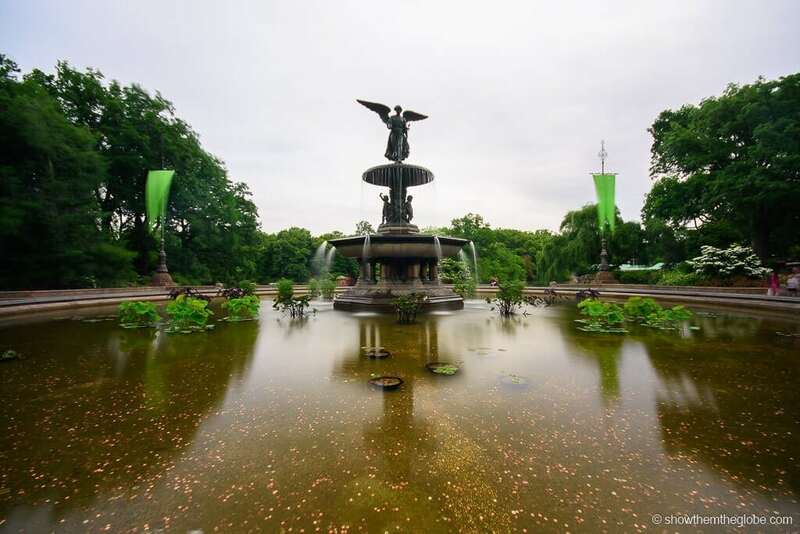 The adjoining Bethesda Fountain is one of New York’s largest fountains and kids will love throwing a coin in the fountain and making a wish. The fountain is topped by a beautiful bronze statue known as the ‘Angel of the Waters’ which represents health, purity, temperance and peace. Open during the summer months, the Victorian Gardens is a small family amusement park aimed at younger kids. 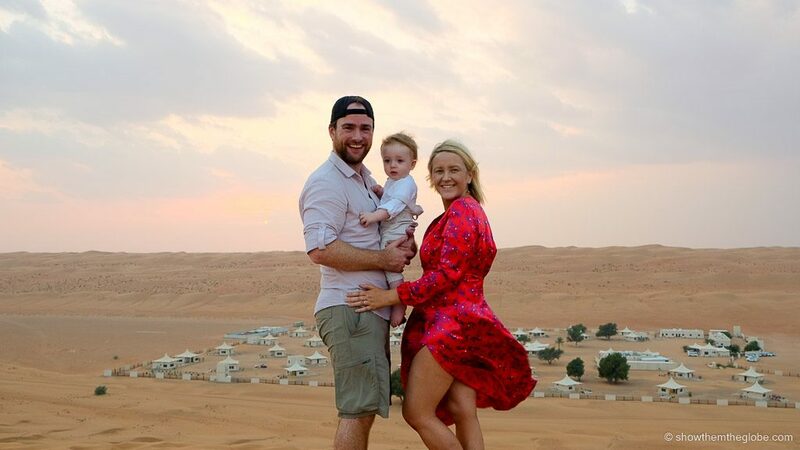 Rides include monster trucks, miniature aeroplanes, a rollercoaster and hot air balloons and it’s easiest to buy an unlimited ride pass and let the kids hop on and off their favourites. Best things to do in Central Park with kids: If you have older or thrill seeking kids, Coney Island in Brooklyn is a great alternative. Umpire Rock, or Rat Rock as it is affectionally known due to the nighttime rat population that once lived there, is one of the most famous rocks in Central Park. It is a magnet for kids who love to attempt clambering up and sliding down the gentler face of the ancient bedrock. Rat Rock is also a popular bouldering spot in Manhattan but the serious climbers attempt to scale the more difficult rock face. The Wollman Memorial Skating Rink, located in the south of the park under the backdrop of skyscrapers and weeping willows, is one of the most beautiful places to skate in New York. It can be crowded and expensive but skating in the Wollman Rink is an awesome Central Park experience and kids will love the music and atmosphere! Best things to do in Central Park with kids tip: the Wollman Rink offers VIP sessions where the number of skaters are limited and it is a great option if you want to avoid some of the crowds. Located under Belvedere Castle, Central Park’s resident turtles can be found in the aptly named Turtle Pond which is sure to bring great excitement in Central Park for kids! Combine a visit to Turtle Pond with the opportunity for little adventures to blow off some steam at the 55-acre Great Lawn. The Great Lawn is the perfect spot for a picnic in the park. It’s also home to the New York Philharmonic’s annual Concerts in the Park series which provides free outdoor concerts on the Great Lawn. 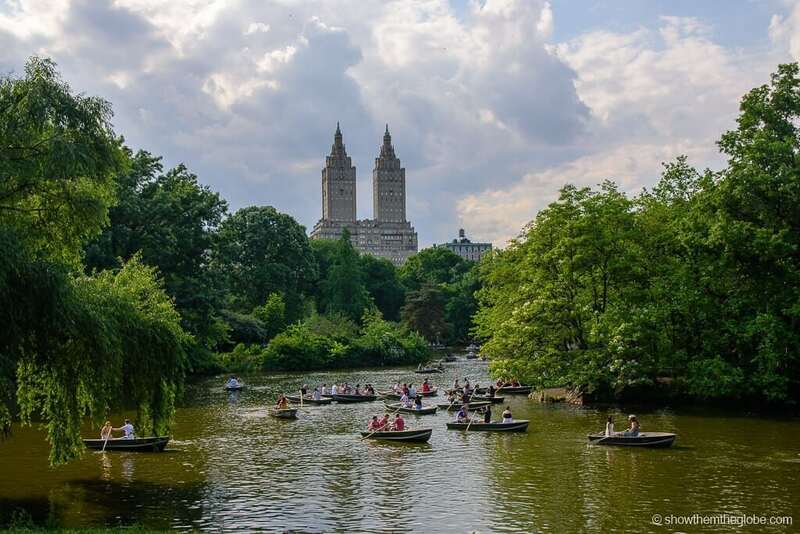 Best things to do in Central Parkwith kids tip: the Great Lawn was once the site of a huge reservoir until it was drained in 1931 and filled with the debris created by the construction of the Rockefeller Center and 8th Avenue subway. Turtle Pond is the last remaining part of the reservoir. 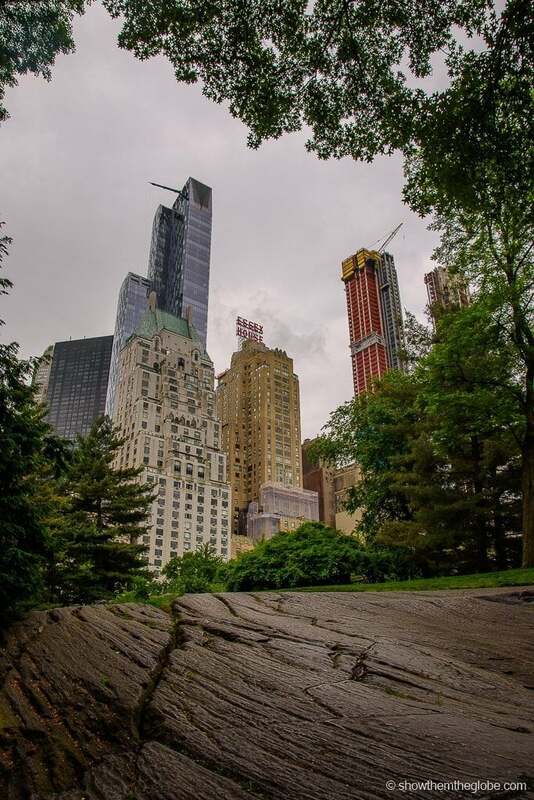 Central Park is open daily from 6am to 1am and there are various entrances between 59th Street and 110th Street and 5th Avenue to Central Park West where the park is located. Park entry is free although some of the individual things to do that we’ve listed above do incur a charge.